"This easy recipe includes rhubarb, crushed pineapple, sugar, and strawberry gelatin, and takes about 30 minutes total to make. I like to use it as a freezer jam since it works so well. You can have fresh rhubarb jam anytime of the year." Place the rhubarb, pineapple, and sugar into a large saucepan. Bring to a boil over medium heat; cook and stir until rhubarb is tender, about 20 minutes. Remove from heat, and stir in gelatin until completely blended. Ladle into glass jars or plastic containers to refrigerate or freeze. 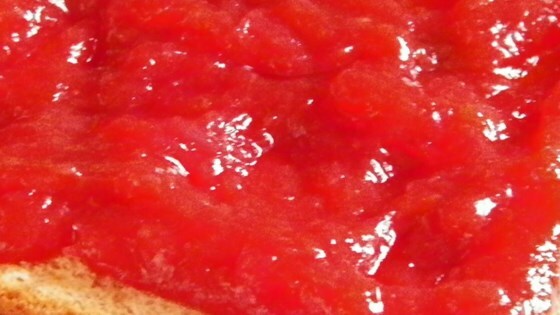 Discover Chef John's secret for low-sugar strawberry jam! This tastes just like the jam my grandmother would make when I was growing up. I've made it and passed out several jars. It was a hit. Thanks for the nice reminder of growing up. I used to make this every year when my children were young. Now I have grandchildren and will make it again this year. Thanks for posting this recipe. I had forgotten it. Absolutely delightful. Just a little too sweet, though, so I will reduce the sugar next time. Perhaps a quarter or third of a cup.